KoopaTV: CONGRATULATIONS Super Mario Odyssey; 9 Million Sold Units?! CONGRATULATIONS Super Mario Odyssey; 9 Million Sold Units?! After years of being called “beleaguered” and jerks deeming its ecosystem to be irrelevant, Nintendo is suddenly being referred to with words like “powerhouse” by the press. This is helped out by its 2017–2018 Quarter 3 (October 1 to December 31) results, released today-ish. It got Nintendo's stock to pop 7%, which makes anyone who sold it when the Nintendo Labo was announced (*cough*Rawk*cough*) look like an idiot. So, what's in those results? Spoiler alert: Nintendo doing fantastically in the biggest shopping period of the year helped a lot. 14.86 million units vs. 13.56 million units. The software gap will obviously be made up as the Switch proceeds. 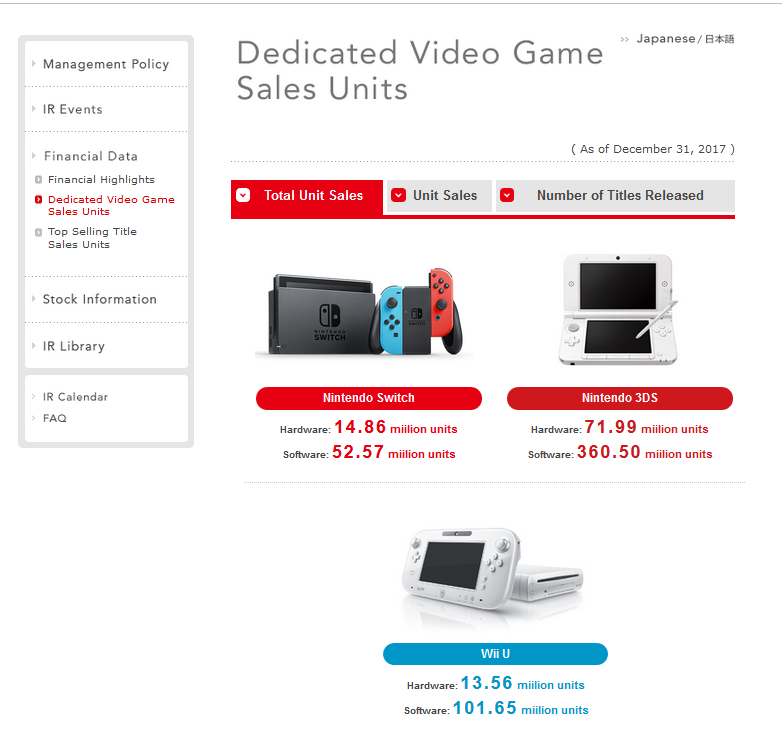 They have increased their already-increased expectations for Nintendo Switch growth from three months ago. Meanwhile, on the software side, The Legend of Zelda: Breath of the Wild is no longer owned by over 50% of Nintendo Switch owners. Also, it looks like ARMS only sold 260,000 copies in the past three months (the HOLIDAY ones), which is weak growth compared to the rest of the Nintendo Switch first-party titles. Guess it's not ever-green! ARMS is... NEVER-GREEN. BWAHAHA. 9.07 million units of Super Mario Odyssey? ...I thought that was a typo. More Nintendo Switch owners are now aware of the evils of Cappy than of any other Nintendo Switch game. 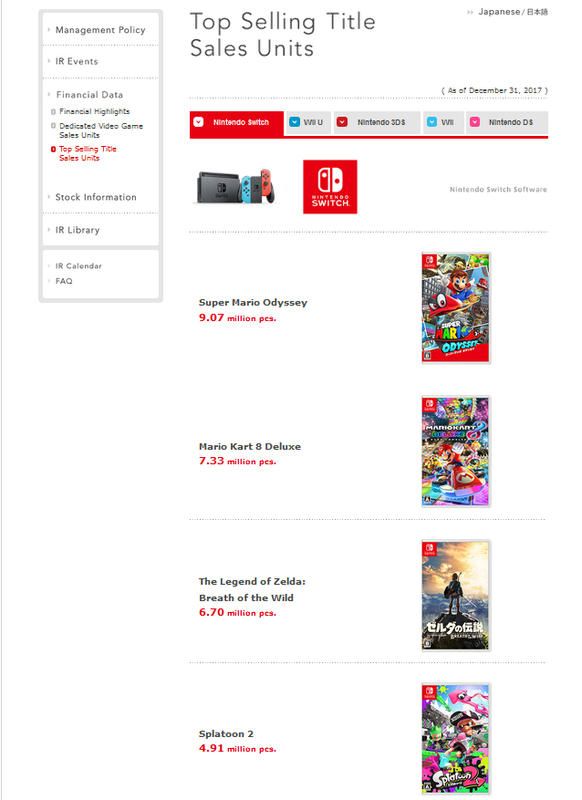 Personally, I had no idea that Super Mario Odyssey would sell THAT MUCH. Meanwhile, Splatoon 2 is notable for being the number one selling Nintendo Switch game in Japan. As for the 3DS, Nintendo says they'll keep supporting it as its own product line, though there aren't any games coming out for it besides Detective Pikachu (a game I have zero curiosity for), and that Sushi Striker game we saw at E3 2017. I forgot that existed. Alright, that's all I got for the 3DS. Nintendo also officially confirmed that report about Illumination Entertainment making a Mario movie, and Shigeru Miyamoto will be heavily involved. Good for him. The Nintendo Labo is considered part of the Switch product line for the purposes of Nintendo's launch schedule to investors. We'll continue treating it as its own product line since that's how Nintendo is marketing it. Nintendo has also announced their next mobile game: Mario Kart Tour. It'll be released somewhere this year or early next year. Who knows. ...Who cares? I sure don't. Nintendo Switch all the way! One more news nugget: Nintendo Switch Online will begin in September 2018. More details to come. When they come, they'll probably get a dedicated article. There are many implications to Super Mario Odyssey being so successful. Perhaps you can think of some in the comments section, since this article didn't actually go into detail on what those are. As far as KoopaTV is concerned, it makes it that much easier to be able to explain the horrors contained with that title if everyone is familiar with it. How much higher are Super Mario Odyssey's sales three months later? Find out! Strangely enough, a crossover between the studio behind the Minions and Nintendo's iconic property is not the craziest idea they worked with in recent year (see: http://www.koopatv.org/2017/08/smart-devs-dont-do-rabbids.html). Of course, I'd still watch it. The attach rate for Nintendo Switch software is very high! In my own time, I noticed that people who have a Switch are typically going to have Breath of the Wild (prior to Odyssey's release), and if they're multiplayer-fanatic, owners would be more inclined to go with Mario Kart 8 DX than Splatoon 2 (speaking of which, I hardly know anybody personal who owns it). It's very interesting to see who owns what in regards to the chart! Maybe we should make a KoopaTV Switch game ownership chart. Bleh. That's a pretty high attach rate in my opinion. I'd love to see how the KoopaTV staff fare towards the sales! I believe that attach rates trend downward over time, so that percent will go down as well. I think it's pretty good. Can you go into detail about how popular Splatoon 2 is over there? Some people did not believe that it is actually the most popular Nintendo Switch game in Japan. I wonder exactly how Mario Kart Tour will work on mobile devices. Even though some phones would not be compatible, I would assume that the karts would be controlled by using the phone's gyroscope to tilt the screen. Although it could turn out to be great, each app that I have downloaded from Nintendo so far I have deleted not long afterwards. Maybe this one will finally be the exception. I am also glad that the paid service will not start until September since I just got my Switch over a week ago. I have only played a little of Splatoon 2 so far since I've been busy with school and work. At least the service will not be too expensive but either way free is always better than not free. There were some FAKE NEWSters saying it got delayed to 2019, but... yeah. I think Kart going to mobile kills off our F-Zero mobile hypothesis.